All of the major copper stocks are declining sharply lower today with most other leading commodities. The iPath Dow Jones-UBS Copper Subindex Total Return ETN (NYSE:JJC) tracks copper and is declining lower this afternoon by 0.82 cents to $59.01 a share. Often traders and investors will follow copper as a leading indicator for economic growth and expansion. The JJC made an all time high on February 14, 2011 at $61.69 a share. 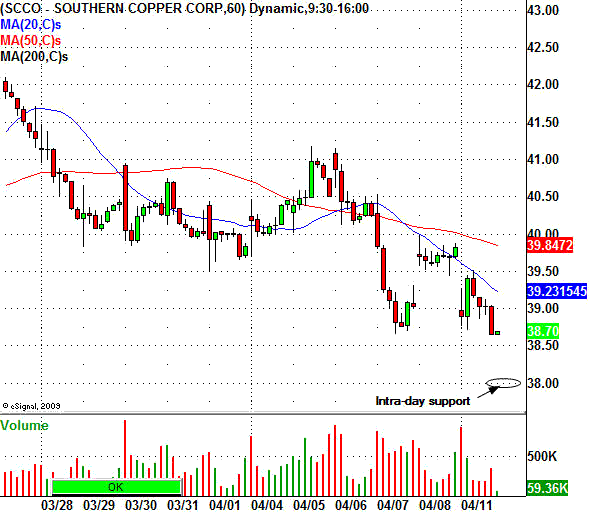 Short term scalp traders can watch for intra-day support around the $58.50 level. Freeport McMoRan Copper & Gold Inc. (NYSE:FCX) is the leading copper stock in the stock market. This copper mining giant is declining lower by $1.96 to to $55.25 a share. FCX stock tested the $58.75 resistance level last week and is coming under heavy selling pressure today. This stock looks to have intra-day support around the $54.50 and $54.00 levels should it sell off throughout the rest of the afternoon. Southern Copper Corp. (NYSE:SCCO) is another popular copper producer that is based out Peru, and other parts of Latin America. This stock topped out on January 3, 2011 at $50.35 a share. Since that high earlier in the year the stock has sold off sharply and is now trading below all of its major daily chart moving averages. This is an indication of weakness and indicative of a solid down trend. The next intra-day level for this stock will be around the $38.00 area.